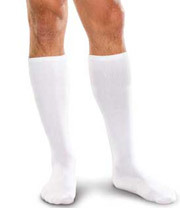 Medical gradient compression socks and stockings improve venous and lymphatic blood flow. THERAFIRM stockings are designed to deliver a controlled amount of pressure which is greatest at the ankle of the garment and gradually decreases towards the top of the stocking. This gradient promotes better venous blood flow which in turn helps to relieve and control edema (swelling), varicose veins, leg fatigue and other problematic leg conditions. Venous Problems: Are you at risk? I sit or stand for prolonged periods of time. If you can answer “yes” to 2 or more of these questions, You are a candidate for compression sock or stocking therapy and Vascular Disease Prevention. Who Would Benefit From Compression Socks or Stockings? Additionally, many people without preceding conditions simply love wearing our gradient compression socks and stockings. Most people love the way they make their legs feel. Conditions that can benefit from wearing gradient compression hosiery. How do Compression Socks and Stockings Help? True Gradient compression socks and stockings improve blood flow. Therafirm compression stockings are designed to deliver a controlled amount of pressure which is greatest at the distal end (ankle) of the garment and gradually decreases towards the proximal end (top) of the stocking. This gradient pressure promotes better circulation to help control swelling and relieve tired achy legs. This motion helps to drive blood back to the heart, reduce swelling in the feet and prevent blood clot formation. Will Insurance Cover my Compression Socks or Stockings? Most insurance companies, through your Extended Health Benefits Coverage, will reimburse for medical compression sock and stocking expenses. A prescription must first be obtained from your doctor, in order to submit the cost of the compression therapy to your extended health benefits provider. Our staff in our North York or Richmond Hill offices can assist you with obtaining a prescription, medical coverage details and filling out detailed extended health claim forms. Dr. Karelis can assess whether gradient compression socks or stockings are right for you. If so, he will recommend the best product for your needs! Pregnancy is a special time but there are bodily changes, changes which may affect your veins. These normal hormonal changes that occur with pregnancy affect the walls of your veins causing the vein walls to relax or dilate. During the first trimester of pregnancy relaxation of the veins occur. Your total blood volume may increase as much as 45% in comparison to your non-pregnant level. The relaxation of the vein walls, in areas of venous valves may cause the valve to become incompetent – therefore allowing backward flow of the venous blood. The reduced flow results in venous congestion, which in turn causes swelling and leg discomfort. Ankle swelling occurs most commonly in pregnant women. During the third trimester of pregnancy the weight of the baby and the uterus may impede return of blood through the veins of your legs. Gradient compression socks and stockings reduce venous congestion, support the superficial veins of your legs, manage the increased blood volume and relaxed vein walls; reducing the amount of swelling and the severity of varicose veins. What causes tired achy legs? Standing and sitting for long periods of time – Blood pools at the ankles and has a hard time returning to the heart. Veins have the job of working against gravity to push the blood upward back to your heart. Healthy veins do this with one-way valves and pulsing movements that encourages the blood to flow up and prevent it from flowing back down. As you age, the valves can malfunction, and the veins may stretch. Blood can stagnate, causing the veins to dilate. Heredity and hormonal changes during pregnancy and diabetes, and standing or sitting for long periods of time also can influence the development of varicose veins. Regular walking, swimming or cycling works the calf and thigh muscles. Contraction of these muscles helps the return of venous blood from the legs back to the heart. Wearing gradient compression socks and stockings won’t eliminate varicose veins, but they can help alleviate the symptoms caused by the veins, such as aching, heaviness, and swelling. It can also prevent worsening of the veins. Spider Veins Spider veins are tiny varicose veins that are a fine networks of red, blue, or purple veins which appear on the thighs, calves, and ankles. Spider Veins form when groups of blood vessels close to the surface of the skin dilate. They make patterns resembling a spider’s web or a sun burst. Age, heredity, hormonal changes, or external injuries increase the likelihood of spider veins. A deep vein thrombosis (DVT) * is a blood clot that forms in a deep vein, * partially or completely blocking the flow of blood. Improperly functioning valves lead to venous congestion in the leg, increasing the risk for chronic venous insufficiency (CVI) and new DVT. A long-term side effect of DVT may be one or more damaged venous valves that allow backward flow of venous blood. Are Compression Socks or Stockings Right for You? Contact our office to schedule a consultation with to find out!